If it were not for the Star Wars themed areas of Hollywood Studios I would have preferred to pass this park up. 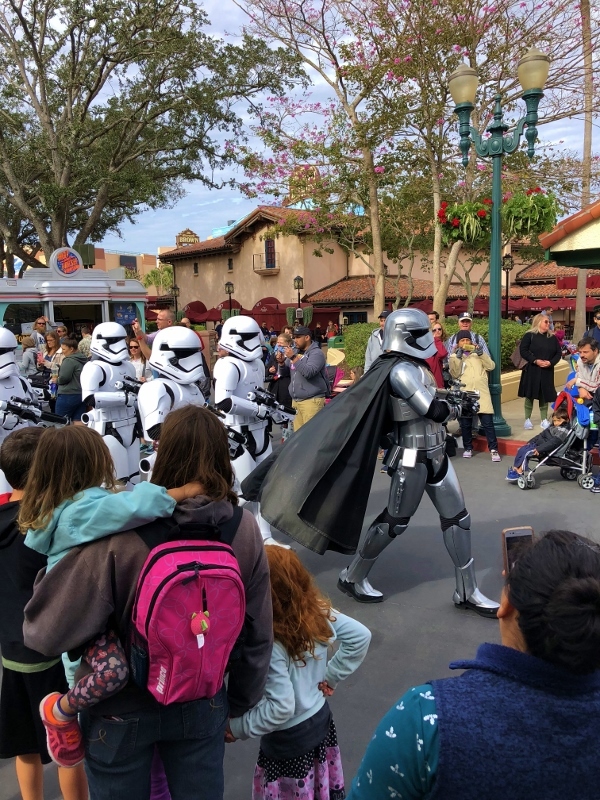 We had too many Star Wars fans in the group--even the 3 y/o who wanted to meet Darth Vader. So we included this one in our plans. Once we had the three day passes, it was only $20 to add the fourth park. The first must-ride on the list was the Rock N Roller roller coaster. It's a favorite of my husband's. It takes off quickly accelerating from 0 to 57 mph in 2.8 minutes. The girls all decided they didn't want to ride it. So while we waited for the rest of the group, we walked over to the Animation Courtyard and slipped into the Voyage of the Little Mermaid. It was a stage production that featured large puppets manipulated by puppeteers dressed all in black. It took a few moments for me to realize that. Everyone was excited when we it began raining on us as we "dove" under the sea. Once out of the Mermaid show, we walked back to the roller coaster but found that they were still waiting to ride. We stood for a few minutes watching the Tower Of Terror and decided it wasn't for us. I rode it once in the past and that was enough. The long hair of the girl in front of me was straight up as we dropped not once but twice. No thanks. Most of the things around us on Sunset Boulevard were shops and snack places. As we explored over the rest of the day that seemed to be what the majority of the park was. 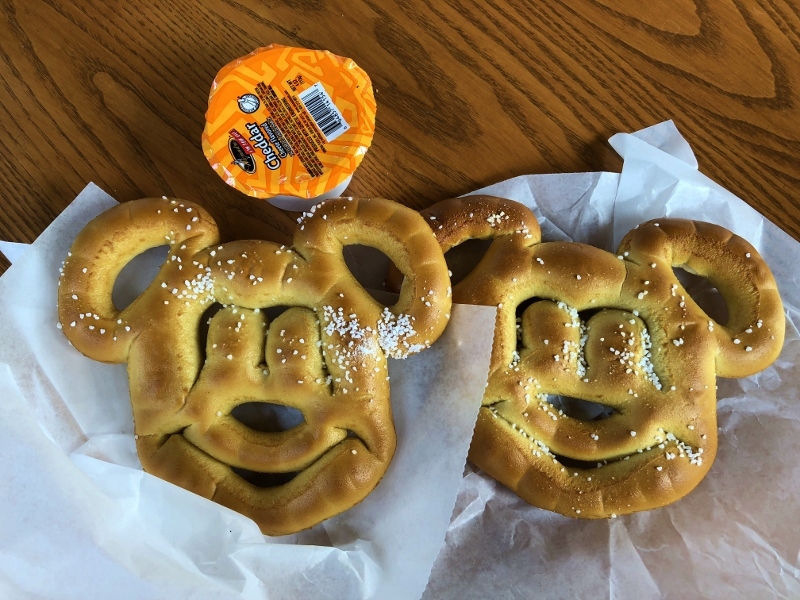 I had been eyeing the large soft Mickey pretzels for two days and I thought this would be a good time to get one. It was large enough to split with the three girls. I went to the stand and ordered one. The girl at the cash register handed me a pretzel and packet of cheese and as I was paying for it, the man behind her reached in the case and pulled out another--"for the little princesses." Amazing generosity. We thoroughly enjoyed our treat. 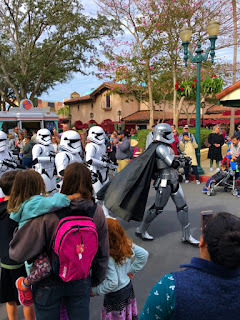 As we headed off to the Star Wars ride, we stopped to wait for a group of Stormtroopers to pass by. Our youngest and I found a spot to sit on some high chairs at an outdoor snack place across from the Star Wars ride to wait. We were treated to a training session of the young Jedis. It held her attention and really wowed her when lo and behold, Darth Vader entered from a cave in the wall. Boy was she going to have a story to tell. We did several other rides but were not going to wait for some of the more popular. We did get a Fastpass to Beauty and the Beast which was a nice production but didn't thrill our 12 y/o grandson. 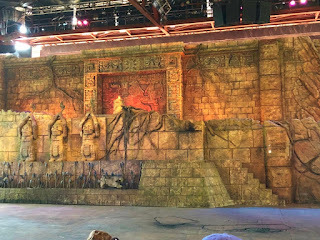 Later we got into see the Indiana Jones stunt show. His response to that: "Sure beats Beauty and the Beast." Dinner was at Mama Melrose and was delicious. 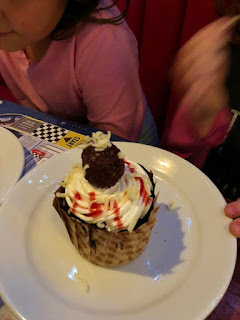 The kids had special dinners and were delighted to have a Spaghetti Cupcake for dessert. The icing was piped to look like spaghetti and the sauce was strawberry. The meatball? Chocolate, of course! 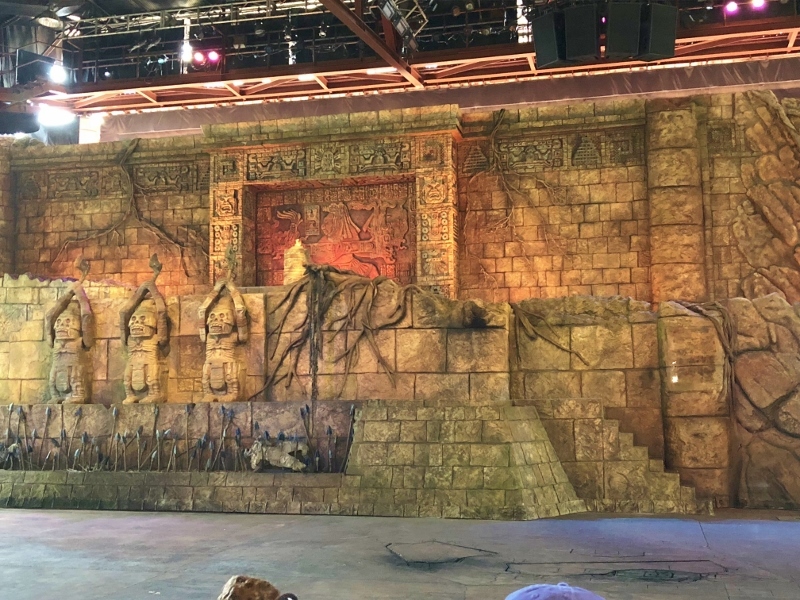 The evening program, Fantasmic, was not much different than what we'd seen a few years ago. The original was quite entertaining with dancing brooms and happy characters but over the years they have changed it from Mickey's imagination dream to his nightmare staring all the villains from their movies. It gets dark and intense for the little ones and I don't find it as charming as the original. 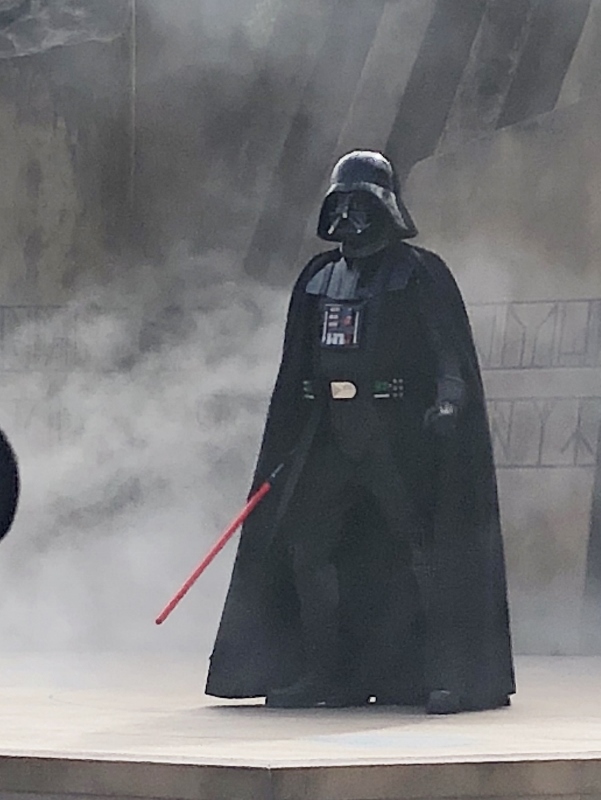 Bob had heard from someone that the Star Wars Gallactica fireworks were not to be missed so after Fantasmic was done, we hustled to find a spot in front of the replica Chinese Grauman Theater. Our little one was falling asleep in Mom's arms so she and I opted to find a park bench nearby where she could sit and hold her. We could still see some of the program which was pretty much a promo for Star Wars movies projected on the theater. The only exciting part was at one point where several fireworks fired from the ground like fountains around the assembled crowd. I don't think any of us were terribly impressed. There are several more rides being built in Hollywood which may make it a bit more interesting. The kids were not impressed with the street venues as actors portrayed various people from Hollywood Studios. That was a bit more adult and usually over their heads. Star Wars, Stormtroopers and Darth Vader all checked off the list, we headed back to the house with a stop at Subway for the next day's sandwiches.